DAMN THAT ENDING TO THE EPISODE HOLY kitten!! WOULDN'T WANT IT ANY OTHER WAY!! Like last time I'll just put what I had in my blog that I wrote. So things went pretty well in this episode. Weiss' home life went pretty much how I expected, but it was still good to actually see. Also important to see that this episode showed was the hardship that RNJR is going through. Seeing death and destruction. However, the best part of the episode was the finale. It was also completely gut wrenching. Jaune kept a video of Pyrrha training him and watches it every night while practicing.... SOBS SOBS SOBS. I knew this would come up, but my body wasn't ready. That last scene... I'm the only one smelling them trying to go for the Ruby and Jaune route? I already got a vague feeling Ruby is into Jaune at least. My cousin Ria is someone else who can also see it going that route. As for me, I can see it, but there needs to be a big substantial moment kinda like when Ichigo saved Rukia, The NaruSaku hug, Kaneki and Touka meeting again after the aogiri arc, or a moment like Ochako's feelings for Deku for me to say okay I'm on board. When Pyrrha was killed I had a feeling RT will be developing Ruby and Jaune I hope it happens. And if it doesn't happen there's always Ruby and the farm kid introduced in the first episode. I still don't know why people are saying he's the spring maiden in disguise. As far as I know the four maidens don't have the ability to change their appearance because if that was the case Amber would have done so and Cinder would have never found her. The fact that the farm boy was introduced could mean he's going to become an important character for the story later on. Some are saying that when he woke up after the villain meeting ended that he saw the whole thing, claiming his semblance is getting visions from the future or premonitions which I think its a good theory. But I think he will save Ruby from Tyrian maybe he will get a vision of Ruby in trouble and he will decide to help her. If none of that happens I'm still rooting for Ruby and Jaune. As long as they don't make White Rose canon and Bumblebee I can live happy. On another topic I am so happy that Cinder looks like crap I can't wait to see that flashback episode when Ruby owned her. She had it coming guess karma is a b****. Edited by Gravenimage, 04 November 2016 - 05:40 AM. I have a feeling Ren knows that symbol that was on the ground and so does Nora. This is good it means they will get development done to both I've been wanting to know more about them I do know they're orphans. Edited by Gravenimage, 04 November 2016 - 06:09 AM. 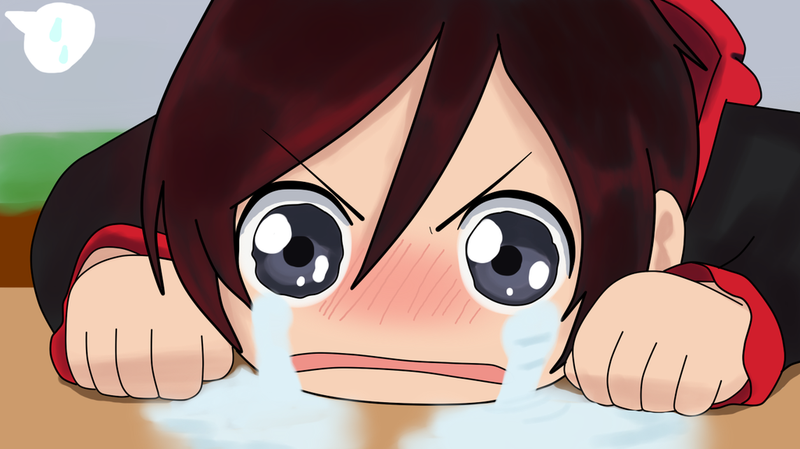 Tfw you are a Ruby x Weiss fan but Jaune x Ruby is getting all the moments now. White Rose or Ruby/Weiss is a made up pairing created by the fans. Ruby has said it a couple of times Weiss is her BFF not her secret crush. But I have gotten sick of it along with Bumblebee when I go to the fan fiction section and there are TONS of those kinds of stories. You know I've been pretty curious about something since the Volume 3 finale, and even the first episode of Volume 4. Salem wants Ruby for something, I'm not entirely sure... This is a theory I came up with months ago and it's kinda far fetch, but do you guys think Ruby will get pushed to a point with the amount of misery that could be inflicted within the story of Volume 4, and that'll push her to see the world differently to a point where Salem persuades her to the side of evil kinda similar to what the Emperor did to Anakin. Again it might be far fetch, but with how dark Rwby's slowly getting I thought it would've been something neat to discuss about. That is if Rooster Teeth plan to take Ruby's character in that direction. Though. I really don't see it happening. That's cliche but it sounds right. I have a feeling the power of the silver eye warriors is what turned Cinder the way she is. In other words their power is the only thing that can truly defeat the power of a maiden. Salem said to Cinder that her power comes with a" crumbling weakness" that must be it a silver eye warrior, makes me wonder if only Ruby can defeat Salem. So yeah I think it will benefit her more if she has her on the side of evil. But I highly doubt Ruby will give up so easily her heart is so pure. She's not going to give up without a fight. I totally agree with you when it comes to Ruby she's a fighter, and she won't be easily persauded by Salem. I like four things from the episode. -One that Blake and Sun are together reunited allowing more development to the BlackSun pairing (I really want to see Bumblebee sunk to the bottom of the ocean). I also like she removed the bow giving more development to her character. -Two that were finally going to meet Blake's family (honestly I thought she was an orphan since she never brought anything of having one during the first three volumes). -Three Yang has finally been shown this early in the volume seems she's suffering from post trauma after Adam cut her arm I don't blame her. -Finally four as I thought it looks like Ozpin is alive and his cane is some kind of relic that Salem is after why??? Edited by Gravenimage, 05 November 2016 - 06:32 PM. Now that I think about it Ozpin's cane being some kind of relic would make sense. It will explain why Qrow had it with him at the end of volume 3. Ozpin must have trusted the cane to him just in case things take a turn for the worse. Edited by Gravenimage, 05 November 2016 - 09:13 PM. You must not have a great memory with this series. The cane is precious and a relic because it is what ensures Bumblebee becomes canon. LOL! I see what you did there. Ehhh, the only ship right now that get's my attention is Jaune and Ruby. And this one barely has a chance from happening. What can I say? I'm a sucker for platonic friendships that turn into romance. You forgot to add that Salem is looking for Ozpin's cane mentioning as some kind of relic.